Could Economic Stress Encourage Better Decisions? Few of us enjoy feeling stressed. However, the reality is that sometimes a little stress can be good for you. When it comes to finances, could a little stress actually benefit you by prompting you to change your habits and make improvements? The last few years have been a bit stressful economically, and it appears that these stresses might have prompted some Americans to make changes in how they handle money. The latest survey results from The Principal Financial Well-Being Index indicates that consumers are changing their habits. According to the survey from Principal Financial, American workers are increasingly using budgets. Thirty-nine percent of the respondents report that they have created a budget to keep track of their finances. This represents an increase from 28 percent two years ago. Not only that, but the survey findings indicate that 52 percent of the respondents have monitored their spending in the past year, and three out of five have emergency funds. Not only that, but of those expecting tax refunds in 2014, about half said that they plan to save or invest the money, and 38 percent say they will pay down their short-term debt. This news represents an improvement over what we saw in the years leading up to the Great Recession, even if Principal Financial reports that only 28 percent of American workers consider themselves financially fit. Some believe that the shock of the financial crisis prompted many people to re-evaluate their spending and saving habits. Indeed, many people were forced to become frugal following the crisis, and many found themselves in financially stressful situations. While these situations can be devastating, they can also be inspiring. When you really have to evaluate your situation, and consider how you are using your money, you are far more likely to make decisions that make more sense for you. The financial stress caused by the aftermath of the financial crisis is still going on in some cases. For some, it still feels like a recession. Savings rates increased after the financial crisis as consumers did their best to prepare for the next shock. Credit card balances dropped as people paid down debt and used less credit. More frugality as people looked for ways to cut costs to make ends meet. A rise in home-based businesses and side hustles as people tried to improve their income. This trend also coincides with the rise of technology that makes it possible. Of course, there has been some backsliding as the populace is removed from the shock of the event. Credit card balances are on the rise again and the savings rate is dropping. With the right economic stress, though, people tend to reform their habits — at least for a little while. Some consumers remember the tough times and make it a point to prepare for the next problem, using the memory of that stress to encourage better decisions. If you think about your finances, where do you fit? 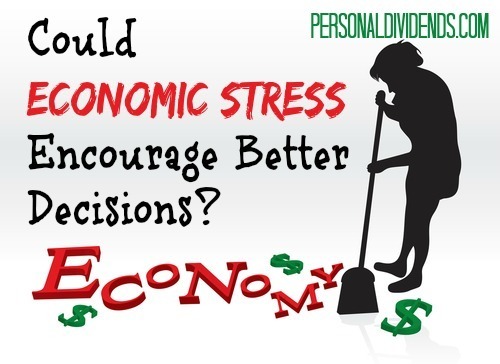 Do you make better decisions during times of economic stress? And do those behavioral changes last?